• MAIN FRAME: Incorporated tube and frame rails that run the length of trailer. • TANK BODY: ¼” GRD 36 ASTM Shell, fully welded inside and out along all seams. • FRAME RAILS: ¼” A572 GRD 50 Formed L channel, fully welded to tank tube with 3/16th backing plates to reduce stress cracks in tube, weight saving cross members. • BAFFLES: 2 – ¼” Formed, pass through design allows egress from rear of trailer to front, designed for ease of cleaning when washing inside. • 3/16” & ¼” Plasma table cut and formed channels for maximum quality. • KING PIN: 2” X 3/8” Bolster on 1/4” 48” L X 40” W Bolted 5TH wheel plate. • LANDING GEAR: Butler 2 speed gear drive 150,000 LB. Static. • SUSPENSION: Hutchens 9700 Series three axle 49” spread, heavy duty 25,000LB capacity. • AXLES: 71.5” Track, 5/8” Wall, 25,000 LB. rating, steel hub pilot hubs, cast drums, “Q” series 16.5” X 7” brake shoes, 30-30 spring break chambers, auto slack adjusters, long wheel studs. • WHEELS: 22.5 X 8.25 Steel white powder coated. • BRAKE SYSTEM: MERITOR WABCO 2S2M Premium ABS system, SEALCO Spring brake valve. • ELECTRICAL: JKD 7 Wire sealed harness , sealed ABS harness. • LIGHTS: 4” JKD LED Tail lights, 2” LED JKD BEE Hive marker lights, D.O.T. approved 1 ½” & 2” Conspicuity tape,, LED Beacon rotating light mounted on the top rear of trailer, Maximma LED ultra bright work light mounted on the sides of rear tank head rear facing to light work area. • CAT WALK: Trailer length Cat Walk with round tube hand rail, form rolled for a clean look, Cat Walk and steps are made from aluminum grip strut for maximum tread grip, toe board incorporated into hand rail. 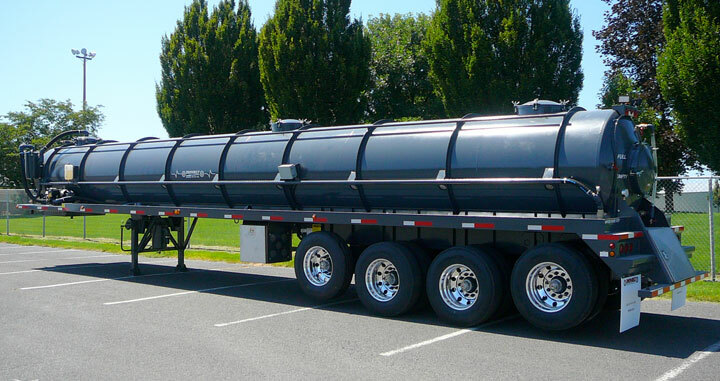 • METAL PREP: Sand blast trailer tube and tank heads inside and out, frame rails and hose trough, cross members, Manway bodies and lids, secondary and oil catch muffler, trailer is sand blasted in welded areas to achieve the best metal profile for the best paint adherence possible. • PRIMER: PPG 2 PART EPOXY 400, 401. • PAINT: Sherwin Williams polyurethane top coat Dionbilt Blue, Grey, White, black. • INNER COATING: Rated for oil field use to resist rust and flaking of liner. • MUD FLAPS: DIONBILT 30” anti spray. This package is a work in progress, as we learn we will adapt our products so we can service the cold weather users to the fullest. We have designed our trailer with the latest ideas from the field, like propane and fire extinguisher mounts in the rear of the trailer. Heat strips on the sump tubes that are fully insulated and wrapped in an enclosure for maximum heat transfer to the valve. Eliminating the need to use open flame to defrost your rear valves. Bendix G2 heated auto air reservoir drain valve on air system. Electric switches to turn this system off during warm months or for maintenance.